It’s hard to see here, but it was terrible. It’s only making contact with his back at two pressure points behind the withers, and otherwise really does not touch his back at all – not under the seat, not under the flaps, nowhere. So for some time now, I’ve been asking him to lift his back and step under himself, and that’s probably the last thing he’s wanted to do with two painful pressure points sending my 105lbs digging into his back with every step. Not cool, man. It’s amazing what routine and complacency will do to a person. 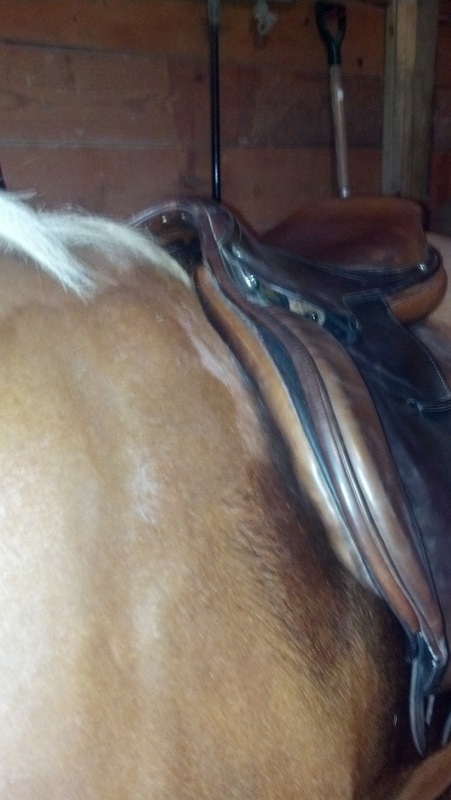 I’m not an accomplished saddle fitter, but I did have classes on it through the course of my equine degree, and I am good at spotting an ill-fitting saddle…when it’s not the horse I see every day, and the saddle that I take for granted fits him as well now as it did eight months ago. I just did not even think about it. Lesson learned. So the Beval is going up for sale, and I am officially on the hunt for a new saddle as soon as it sells. Here is a link to the listing on eBay, if you know of anyone who might be interested, please send them my way! The saddle is gorgeous. Hope it sells quickly and you find something that works for you. Thanks! I'm that way selling horses too, details, details, details, for better or worse. Eagle, Idaho wouldn't happen to be in your neck of the woods, would it? I'm seriously looking at a saddle located there. Feel free to respond through email if you'd rather not share your location. Nice sale add, Jen! You will have no problem selling it. I hate saddle shopping, but when you find the right one - all worth it. If Ebay doesn't work try selling it on Craigslist. I sold a Beval I picked up at a sale on Craigslit to a very happy HJ trainer.